"Family Matters Marred By Foul Language"
ANT-MAN AND THE WASP finds Scott Lang, the Ant-Man, under house arrest for violating international accords against superheroes, when he decides to help his former mentor, Hank Pym, and his daughter, Hope, save Hank’s wife and Hope’s mother, who’s trapped in the subatomic quantum realm. ANT-MAN AND THE WASP is a highly entertaining sequel. It has a driving plot, lots of great laughs, exciting action, and heartwarming themes about parents and children, but it’s marred by excessive foul language, which undermine the movie’s strong family-friendly features. 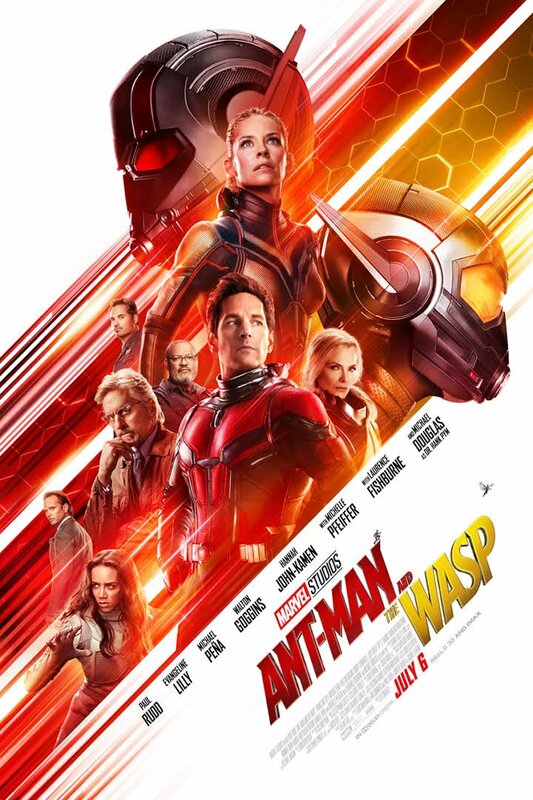 ANT-MAN AND THE WASP finds Scott Lang, the Ant-Man, under house arrest for violating international accords against superheroes, when he decides to help his former mentor, Hank Pym, and Hank’s daughter, Hope, save Hank’s wife and Hope’s mother, who’s been trapped in the subatomic quantum realm. ANT-MAN AND THE WASP is a highly entertaining sequel. It has a driving plot, lots of great laughs, exciting action, and heartwarming themes about parents and children, but it’s marred by lots of foul language, including three gratuitous strong profanities, which undermine the movie’s strong family-friendly features. The movie opens with Scott and his daughter, Cassie, playing an Ant-Man adventure in Scott’s townhouse. The adventure ends with a slide down a cardboard contraption. Unfortunately, Scott’s foot accidentally breached fence outside his house, and his anklet device alerts the FBI. The FBI placed Scott under house arrest after he used the Ant-Man suit to help Captain America in Cap’s fight for freedom overseas, in violation of the international accords against superheroes acting on their own without United Nations approval. The FBI searches Scott’s place to make sure he isn’t in contact with his former mentor, Hank Pym, the creator of the Ant-Man suit. Meanwhile, Hank and his daughter, Hope, have had to go underground because of Scott’s actions. They are upset that Scott didn’t tell them about taking the Ant-Man suit to help Captain America. Although the FBI seized Hank’s house and equipment, he and Hope are using an office building as an underground lab. They are trying to build a quantum tunnel to the subatomic quantum realm, in hopes that Hank’s wife and Hope’s mother is still alive. Cut to Scott at his place, where he has a vision about Hope’s mother, Janet, playing hide and seek with her daughter. Scott uses a burner phone to alert Hank and Hope about the vision. Using the new prototype of her mother’s Wasp suit, Hope snatches Scott and puts his ankle bracelet on a giant ant programmed to mimic Scott’s daily routine. Back at the secret lab, Hank and Hope figure that Hope’s mother, Janet, has established some kind of communication link though Scott when he visited the quantum realm. They hope to use that link to find Janet’s location and bring her home. However, Hope and Scott run into some complications. An underground technology thief with whom Hope has been dealing wants to steal Hank’s lab and sell it to the highest bidder. Also, a young woman named Ava wants to steal the lab, because the ongoing effects of a quantum explosion when she was a child is starting to kill her. Ava wants to siphon quantum energy from Hope’s mother, Janet, but Ava’s plan to do that may kill Janet. Can Scott and Hope help Hank bring back Janet? Can Scott escape the watchful eyes of the FBI long enough, so they won’t lock him away for 20 years? Can Scott and his friends outwit the technology thief and Ava? ANT-MAN AND THE WASP may be the most entertaining, best structured Marvel movie since Sony made the first two Spider-Man movies. The movie’s action, humor, and heartwarming messages are almost perfectly integrated with one another. The movie is thrilling and very funny. All the actors do a marvelous job. Also, the story is constantly using its character arcs and relationships to promote positive family themes. In fact, the whole movie is about the special bond between parents and children. The scenes between Scott and his own daughter, for example, are very precious, poignant and winsome. However, that’s why it’s doubly disappointing and annoying that the movie’s dialogue contains lots of mostly light obscenities and a few strong profanities that put the movie out of bounds for children and will offend Christians and other media-wise moviegoers. Without that foul language, ANT-MAN AND THE WASP may have been a Plus One movie, or even better. Some lying, people are injected with “truth serum,” a subatomic link allows a woman trapped in a subatomic realm to speak through a man’s voice to her husband and daughter in one scene, and heroes try to hide from and evade federal authorities who have become too tyrannical and mean. ANT-MAN AND THE WASP opens with Scott Lang, the Ant-Man, under house arrest for violating the international accords restricting superheroes. Meanwhile, the creator of the Ant-Man suit, Hank Pym, and his daughter, Hope, have gone underground because of Scott’s actions. The FBI seized Hank’s house and equipment, but he and Hope are using an office building as an underground lab. They hope to retrieve Hank’s wife and Hope’s mother from the subatomic quantum realm, where she’s been trapped for 30 years. Scott risks his freedom to help them, because Hope’s mother established a link through him when he visited the quantum realm. ANT-MAN AND THE WASP is one of the most entertaining superhero movies. The action, humor and heartwarming messages are perfectly blended together. The movie is thrilling and very funny. Also, the story brilliantly uses its character arcs and relationships to promote positive family themes. The scenes between Scott and his daughter are very precious, poignant and winsome. However, that’s why it’s even more disappointing that the dialogue contains excessive foul language. Sadly, ANT-MAN AND THE WASP warrants strong caution.